This Fish had a small Mouth without Teeth: The Body somewhat long and round: The two Finns behind the Gills are extraordinary large, and spread very wide. On the hind-part of the Back was another small Finn, and under it on the Belly was a fourth. The Tail large and forked: The Scales like those of a Herring, but of a darker Colour. These Fish are seen in most Parts of the Torrid Zone, and inhabit not the Northern Climates; yet in Summer some few wander to the Latitude of 40 Degrees. As they are a Prey to both Fish and Fowl, Nature has given them those large Finns, which serve them not only for Swimming, but likewise for Flight. They are good eating Fish, and are caught plentifully on the Coasts of Barbados, where at certain Seasons of the Year the Markets are supplyed with them. This is the common Size of this Fish. The Finn on the Back was prickly before and not behind: Two Finns were placed behind the Gills, one under the Abdomen, and a fifth between that and the Tail; to the forepart of which is joined three sharp pointed Bones: The upper Part of the Body was brown, with large Spots of dusky yellow; the under part of the Body was alternately streaked with white and yellow; the Eyes and Gills were variously colour'd with white, red and yellow: the Tail forked and red at the End. These Fish are most commonly seen in warm Climates, and in crossing the Atlantick Ocean Ships Rudders are seldom free from them: they seem to gather their Nutriment from the Slime adhering to the Rudder and Bottom of the Ships; and tho' so small a Fish, they keep Pace with Ships in their swiftest Course. This Pearch is generally small, rarely growing to the Size of a Man's Hand: The upper-part of it dusky blue, the Back being darkest; the Belly yellow; the Gills blue, with some Streaks of dark yellow, with a red Spot at the Angle of each Gill; joining to which was a black Spot, which distinguishes it from all the Fish I have ever seen: It had one Finn on the Back, the forepart of which had prickly Spines, the hind-part smooth; two behind the Gills, a prickly one under the Abdomen; and another between that and the Tail, with two Prickles: The Tail forked, the Tail and Finns brown, except that under the Abdomen. 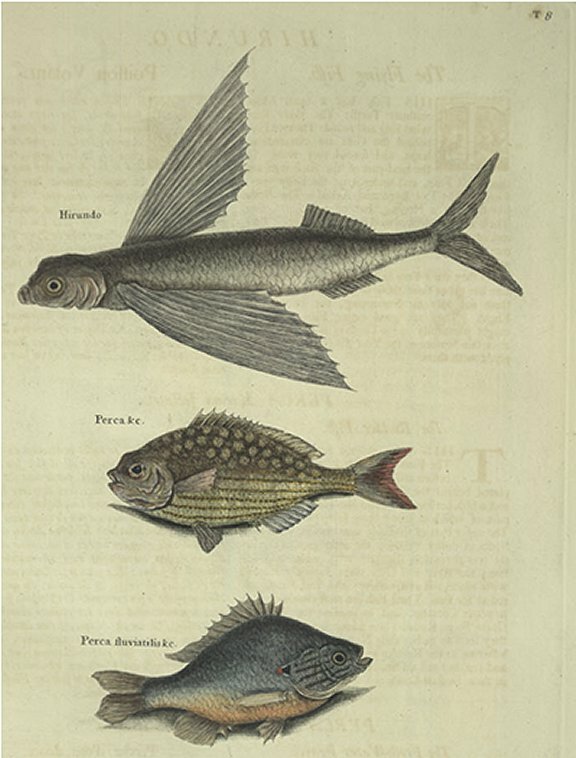 Of these Fish there are plenty both in Carolina and Virginia: They are found mostly in MillPonds and other standing fresh waters: They are called by some Ground Perch, from their burrowing into, and covering themselves in the Mud or Sand.